More than one year ago, I thought of suggesting a better traffic light. I had realized traffic lights were causing more traffic jams instead of helping the traffic when used in fourlane crossings. The traffic lights indicated by yellow arrows lock the crossing, causing traffic jams. 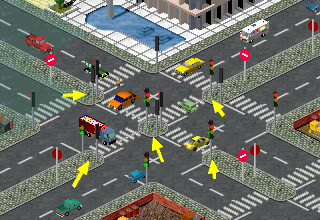 "Red" traffic lights, as shown above, would be automatically removed when you build traffic lights near another. Very nice idea. But I think this is a lot of work. If you have not a good function for this, you will get new traffic jams. I suspect people missed this topic. What when a player uses 3 roads next to each other in a city to prevent overtaking (and setting the speed limit to 50 km/h) by city roads? Those are 5 tiles of the three roads, named for convenience. A1-B1-C1 are connected, as well as A5-B5-C5. The cross-street runs at column 3, and intersects at A3 and C3, but from B2-B4 is a bridge. One-way / do-not-enter signs posted on A2/C2 and A4/C4. Make sense, or do I need to do a screenie? I've been playing around trying to devise a way to make a 4-way intersection work a little smoother without having traffic stuck in the intersection during a signal change. 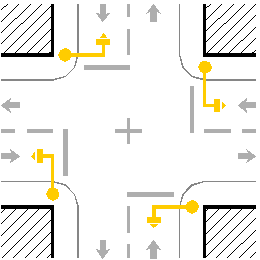 By placing the traffic signals outside of the actual intersection, putting them at a "t" junction just before, it opens up the main intersection to much more fluid traffic flow without the worry of traffic being stuck inside of the intersection, as the one-way signals keep traffic from encountering another traffic signal once they are permitted in to the intersection. I am able to get much smoother traffic flow with this method, the only speed limitation being that during turns the entire intersection must be clear before the vehicles proceed, but still much more effective then before. What would be nice is not having to build the "t" intersections before the main intersection in order to hold the traffic lights. Traffic lights cannot be built on a section of 2-way road that doesn't have an intersection... though I can't imagine that this limitation is for anything other than just a flag that doesn't allow it "because it doesn't make sense". If this is an easy fix, can we allow to placement of traffic lights on straight sections of road without an intersection? This would also be handy for placing lights before freeways to pace traffic flow on to a busy freeway section. EDIT I realized that I could bulldoze the "t" intersection after I placed the traffic lights, so I am able to make it work fine. Ah, I'm too late to reply! I discovered the bulldoze trick – because I use that when I pretend I have different countries or territories, so I build them to cause traffic to stop at the "border" with a long red and short green. It's also useful to space out convois – you can set up a little sideloop of road and put a waypoint to force lines to use the road and space them out that way. Topic merged due to http://forum.simutrans.com/index.php?topic=16659.msg164554#msg164554. Hello everyone, taking advantage of this topic, wanted a help. Anyone know how do I leave all the red traffic light at least 5 seconds of each time? The traffic light problem is that the vehicles do not have time to leave the crossing free, as it happens the change from red to green, for the vehicles of north / south, the vehicles that were released from east / west is still at the intersection , and therefore, sometimes, causes a blockage and, as a consequence, congestion. Leaving the red traffic lights at least 5 seconds after the next change, this time, would serve to leave the crossing free, and thus, avoid that problem. You can set the length of the cycles like that. For the straight use 16 32 and for the other 32 16 That way there are 8 cycles with all red. For the straight use 16 32 and for the other 32 16 That way there are 8 cycles with all red. So should I change east / west 16 32. And set the north / south semaphores to 32 16? In principle that should do it. It may depend on the position, or they may loose their synchronisation after reload.